A strategic alliance is an agreement between two or more parties to pursue a set of agreed upon objectives needed while remaining independent organizations. A strategic alliance will usually fall short of a legal partnership entity, agency, or corporate affiliate relationship. #Strategic alliances are critical to achieving success in today’s competitive business environment. Jason Arnold from @InspireSoftware explains the #Leadership Genius approach to leading an alliance!Tweet This! Once you understand your individual role as a leader, and how that works in a One-to-One context with direct reports, with a team of individuals, or an organization as a whole, you’re better positioned to lead an alliance between two or more organizations to achieve one common business objective. Alliances can occur on any of several levels. An alliance could be as simple as a partnership between two individuals or between an individual and an organization--like a third-party contractor. But most alliances in today’s business world are likely between two organizations or two organizational units within an organization. There are two different types of alliances organizations can form: internal and external. Internal alliances are formed between business units, who have their set of responsibilities and duties but need to work together to achieve a common objective. When Marketing and Sales work together with a Product Development unit to help shape and create a product or service to meet the needs of their ideal client--that is considered an Internal alliance. 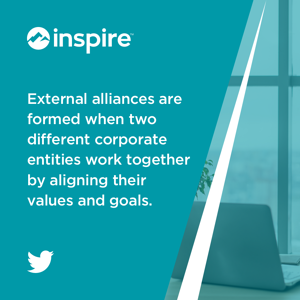 External alliances are formed when two different corporate entities work together by aligning their values and establishing goals. Strategic networking is at the heart of forming these strategic alliances. Alliances are formed based on a common purpose, working together to achieve a common goal. The difference between a strategic alliance and a basic relationship is that the strategic alliance is defined by purpose, while a relationship is based on an emotional connection or physical proximity to someone else. You have a relationship with your neighbors because you live near them, but you form an alliance with them because you need to achieve a common objective, like form a neighborhood watch program to keep the neighborhood safe. Although internal alliances are formed to accomplish immediate purposes like complete a project or release a new product, external alliances are generally focused on accomplishing long-term objectives that generate a significant market share and profitability for an extended period of time, that could not be achieved as two individual organizations. An alliance formed between an airline and a hotel chain will serve the ongoing needs of a certain market segment of tourists. 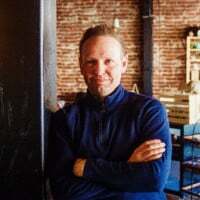 Larry E. Greiner was one of the first to thought leaders on the formation of alliances in his studies on the growth of organizations during the dawn of the 21st century. In his article, Evolution and Revolution as Organizations Grow, Greiner noted that the collaboration phase of an organization is the highest phase of organizational transformation. The collaboration phase entails spontaneity in management action through teams and the skillful confrontation of interpersonal differences. Much like interpersonal relationships, inter-organizational relationships thrive on a similar collaboration phase. The most important aspect of an alliance is not confronting interpersonal differences, but the integration of core competencies, to successfully master this level of organizational relationships. Leadership in an internal or external alliance context takes a skillful integration of core competencies, that exist in separate units or organizations, and bring them together for one common purpose. With that being said, it is not easy maintaining an alliance. They tend to face many challenges. Many challenges an alliance can face outside of overcoming a common purpose are operational in nature. Much like challenges that hinder professional growth within your own company, you must overcome them with your skills to lead an alliance. After alliances are formed by overcoming the challenges associated with defining purpose, the face significant operational challenges. Because alliances are often created between two different organizations or business units, the biggest challenge they face is often the issue of accountability. How will they hold each other accountable? Who decides on what they should be held accountable for? How do you bring together different entities that have different purposes and have them focus on one common purpose? What steps must be taken or what resources are needed for the alliance members to rely upon if one of their partners falls through? How does the alliance maintain vibrancy and commitment over time? What happens when the alliance faces partner turnover with inexperienced newcomers? Where authority within operations lies. Leading an organization is complex. Now add the responsibility of having to bring together two completely separate entities to achieve one common goal. Read more about the #strategic alliance context from @InspireSoftware! :Tweet this! When alliances are led properly to conquer the obstacles in the way, there is no better tool to leverage. When IBM went from being a sole company in the 1990s to a powerhouse with nearly 90,000 strategic alliances, it was not just happenstance. It took great leadership in the alliance context to grow IBM without losing it’s brand identity and foundation. Companies are discovering professional growth and an acceleration of growth in an economic downturn thanks to strategic networking. Since this is a fairly new concept in terms of leadership and organizational operations, leading in the alliance context may be the most important competency for leaders to master in the coming decades. Curious about the other contexts of leadership discussed in the book? Check them out here!